New Life Spectrum Fish Food not only increases the color and vitality of both freshwater and marine fish, it provides essential elements found in the natural environment that are missing from aquariums. 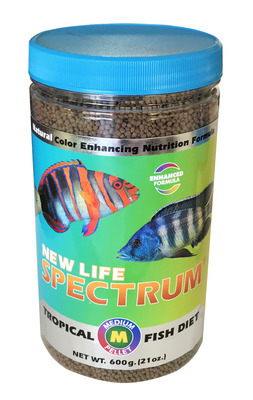 New Life Spectrum Premium Fish Food is a Hormone-free, color enhancing formula. Spectrum food is made with high-quality easily digestible krill, fish-meal protein, and four all-natural color-enhancing ingredients for a balanced diet that boosts immune system function and enhances the full spectrum of your fish�s color. New Life Spectrum�Medium Fish Formula. Hormone-Free Color Enhancing 2mm Sinking Pellets. Easy Digestable Krill andHerring Protein. Balanced daily diet for Carnivore,Omnivore and Herbivore Cichlids. Ehances the full spectrum of your fish's color.